Second only to Mandarin, Spanish has more native speakers worldwide than any other language. With over 500 million speakers, Spanish is the official language of 21 countries. And while Christian resources abound in some counties, many workers are at a loss as to how to get them into the hands of Spanish speaking believers across the world and, especially, in access challenged regions. The Digital Bible Society created Spanish Treasures with this need in mind. Introduced in 2012, Spanish Treasures consists of Spanish Bibles, audio Scriptures, scores of books and commentaries, videos, literacy tools and audio recordings. Spanish Treasures, as are all the Digital Bible Society libraries, are free-to-copy and free-to-distribute. Long term goals include the initiative to expand the basic Spanish library with a growing number or discipleship and training resources as well as to target separate regions of the world by including the hundreds of minority Bible texts and resources that are located in Spanish speaking nations, to the end that every person, in every nation, would have the opportunity to hear or read the Scriptures in their own heart language. 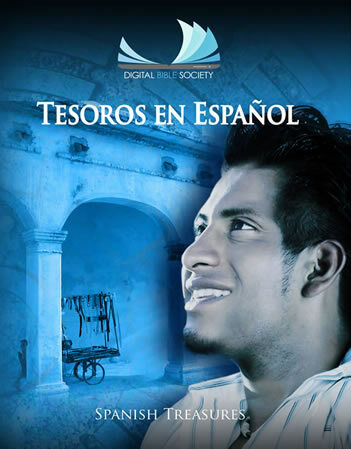 The Digital Bible Society created Spanish Treasures with this need in mind. Introduced in 2012, Spanish Treasures consists of Spanish Bibles, audio Scriptures, scores of books and commentaries, videos, literacy tools and audio recordings. Spanish Treasures, as are all the Digital Bible Society libraries, are free-to-copy and free-to-distribute. Long term goals include the initiative to expand the basic Spanish library with a growing number or discipleship and training resources as well as to target separate regions of the world by including the hundreds of minority Bible texts and resources that are located in Spanish speaking nations, to the end that every person, in every nation, would have the opportunity to hear or read the Scriptures in their own heart language.